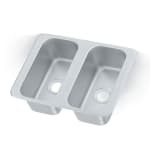 Vollrath 12065-2 (2) Compartment Drop-in Sink - 6.125" x 12.125"
(2) Compartment Drop-in Sink - 6.125" x 12.125"
Our sinks are made with the same care and highest quality that goes into our cooking and serving pieces. They are built and designed to withstand the vigorous use in commercial/professional kitchen. Your staff will appreciate the liberal radius in our sink bowl corners and no-drip sink counter tops. All of these features make these sinks easy to maintain. Component sink parts are readily available.